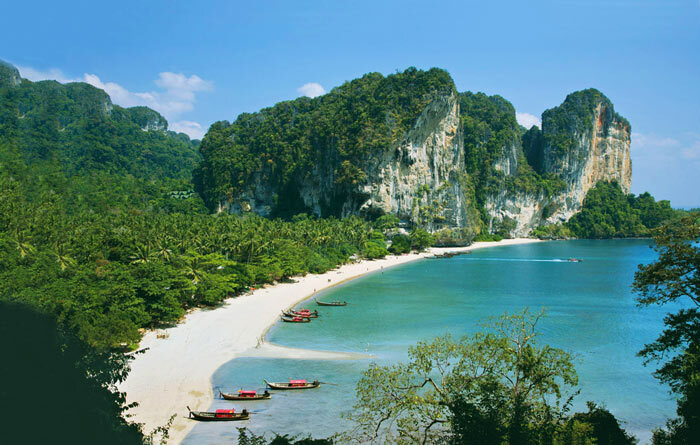 Next in the list of the best Thai beaches — Railay Beach, located on a small peninsula. He reliable protection — high steep cliffs that separate the beach from the mainland. Highlights from Railay Beach a lot. One of them is the lack of roads and cars, respectively. To get to the beach can be by sea, by boat or boats. Railay Beach is beautiful! Like most Thai beaches here emerald water and white sand. However, the main beauty of this place is considered to be the limestone cliffs, caves and lagoons. On this beach ride is not just soak up the sun, which is constantly, in spite of the tall rocky promontory. Railay Beach — a place where climbers are going to conquer the summit and look at the amazing landscapes, opening with them.